The one thing better than the regular after work round of drinks would have to be a mid-afternoon tipple on a Monday. I took the day off to hang with M&A who are visiting from London for a bit, and it just so happened that M was craving something sweet and bubbly. We cracked our heads over where to go for a drink in the afternoon and came up with zilch (how can this be!?! We live in such a cosmopolitan city yet I couldn't think of a single watering hole that would be good for a tea-time-tipple). Rather than waste more time trying to find a place to go, I decided to have them over for a round of prosecco by the pool. This drink has all the best things about summer in a glass - the sweet flavours of strawberry, a hint of mint, topped off with a lot of bubbles. The slight tartness of the strawberries keeps it from being saccharine. I'm tempted to name it the Summer Sparkler - but the cheese factor in that is in overdrive. I know I'll never write a cookbook because I do everything in the kitchen in rough guesstimates. This is why I love cooking, and abhor baking, because when you cook you have the luxury of going by feel - baking is far too precise for me with all the measuring cups, scales and what not. Just a little bit too much or too little of something and *pouf* there goes your meringue. Anyhoos, for this recipe you'll need two bottles of prosecco to comfortably feed 4 thirsty people or 6 moderate drinkers (it will make about 12 glasses). Between you and me, if you're mixing anything in with the bubbles, it's fairly safe to go with the cheap stuff - save the Dom Perignon for when you're serving it straight up. Place 1 cup of frozen strawberries into a blender. Dissolve sugar in 1/2 cup of hot water, pour over strawberries. Throw in the mint. Blend till smooth. This should yield about 1 cup of strawberry-mint puree (second picture). Okay, now here's a trick I learned to stop the champagne from spewing everywhere while making these things (Only people who've done this before will know what I'm talking about. Basically, when the bubbles meet the puree for the first time, it starts to bubble and foam uncontrollably. So you have to do this gently). In a champagne flute, spoon 3 teaspoons of puree. Pour in about a shot of bubbly. Mix gently with a teaspoon. 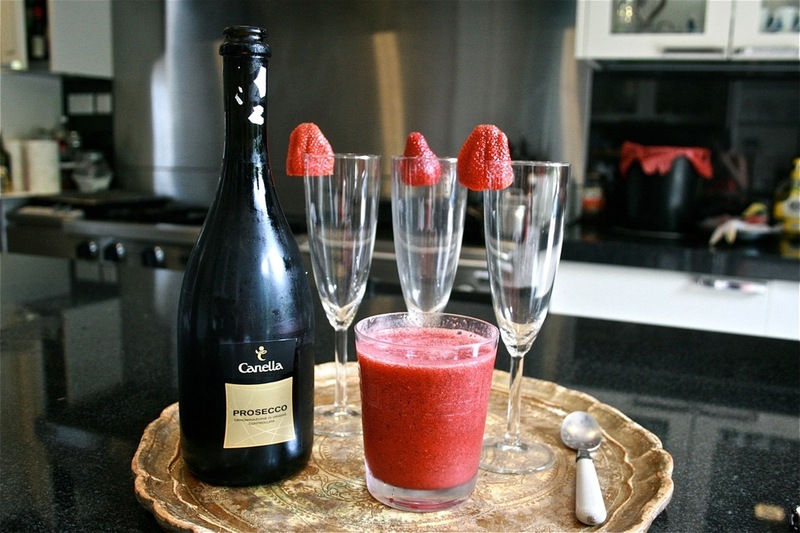 Once combined, fill the flute to the top with bubbly and garnish with a slice of strawberry. Tadah! These drinks are perfect for a garden party, a summer solstice, or a spring fling. They're also a nice change from the usual mimosa that's served at brunch. The hint of pink makes it ideal for romantic occasions, like Valentine's day or an anniversary. It's also pretty perfect for a bridal shower.